Yesterday, Georgetown Current’s Carol Buckley alerted GM to the draconian plan that WMATA is floating to close a massive budget gap. Among other changes, the proposal would stop all weekend late-night bus service between Georgetown and Dupont Circle and cut early morning service as well. Cut off all bus service at 12:44 Friday night and 12:55 Saturday night (that’s four different buses each night). Cut off all westbound service from Howard at 11:44 Friday night and 11:47 Saturday night. Cut off all eastbound from GU at 12:18 Friday night and 12:22 Saturday night. Last week GM detailed some changes to the D Series bus schedule. One thing that confused him was that WMATA had been contemplating changes for the D Series for quite some time. Yet the changes announced last week appeared to be part of a systemic not targeted change. The website for the D Series study is now essentially wiped of all mention of the D Series Study. GM reached out to WMATA and got confirmation that the changes announced last week are indeed the end result of this year’s study. Following his inquiry a press release was issued clarifying the matter. D5 will extend its nighttime hours. WMATA is a little tricky about describing this. In the release they describe it as “Two additional westbound buses will be scheduled to depart at 3:20 and 6:55 p.m. from Farragut Square.” That would sound like they’ve added two new buses to the schedule. In fact they only added one more bus; they extended the schedule a little further more by extending the headways (i.e. the wait between buses). Today WMATA announced a raft of changes to Metrobus routes throughout the region. 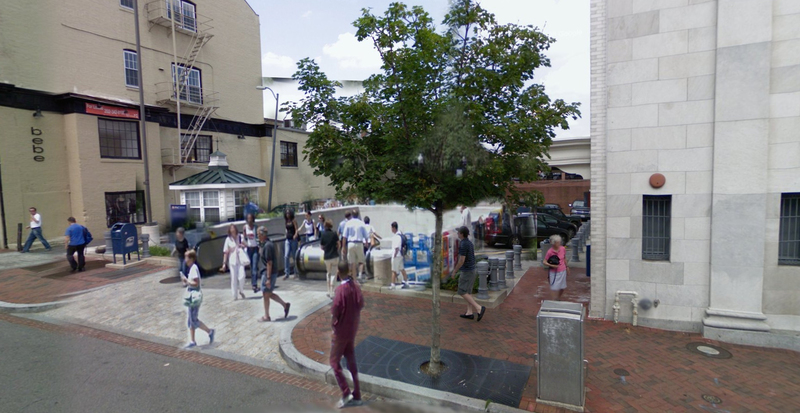 Some of the changes directly affect Georgetown residents. They will take effect December 27th. If you ride the D Series, keep reading. The route will be changed to operate between Glover Park and Federal Triangle. Eastbound buses will follow the regular route from Glover Park to 13th and E Streets, NW, then continue via 13th Street onto Pennsylvania Avenue to the terminal stand on the west side of 10th Street, NW. The westbound route will begin at this terminal stand and continue via Constitution Avenue, 12th Street, Pennsylvania Avenue, 13th Street and resume the regular route. Two new buses will be scheduled to leave eastbound from Glover Park at 9:05 a.m. and westbound from Federal Triangle at 7:05 p.m. The bus schedule will change. In celebration of the Georgetown Metropolitan’s one year anniversary, GM is taking a look back at the top five most popular articles from last year. Today: Where Would a Metro Stop Go Anyway? 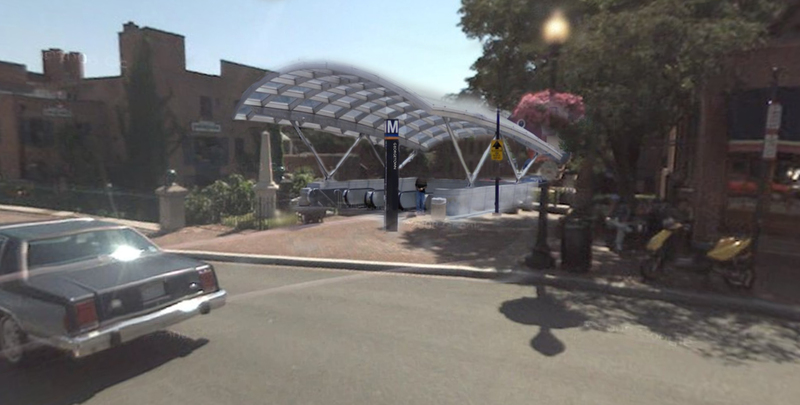 While it is now little more than a glimmer in transit nerds’ eyes, the likelihood of a Georgetown metro station getting built is larger than you may realize. On the right is a map that appeared in the Washington Post in 2001. It described long term plans that WMATA was considering for the expansion of the Metrorail system. Those plans called for a splitting of the Orange and Blue lines. The new Blue line would split off from the Orange line at Rosslyn and travel parallel to the Orange line through downtown, finally meeting up with it again at Stadium-Armory. In building this separate Blue line, WMATA would have the chance to remedy the mistake it made decades ago and finally build a Georgetown station. In an act of enormous cart-before-the-horseing, GM wonders: where exactly would this station go anyway? But before we get to that, we need to go back to the 1960’s first. The first thing to address if you’re going to start talking about the history of Metro and Georgetown is the old canard about why Georgetown doesn’t have a station in the first place. The story goes that in the 1960’s a bunch of rich Georgetowners didn’t want hordes of minorities coming into their neighborhood on the Metro so they successfully petitioned WMATA to nix any plans for a stop. This telling of this story chugs along year-after-year because it fits in with the negative stereotype of a Georgetown resident: rich, racist, and well-connected. Unfortunately for the storytellers, it’s fiction. George Mason professor Zachary Schrag tracked down the true story of why there’s no Georgetown stop. In his definitive history of the building of the Metro “The Great Society Subway“, Schrag writes that while there was some opposition to the building of metro stop in Georgetown from the residents, the engineers never seriously considered building one there. The grade from the Potomac up to M St. was too steep. Moreover, plenty of neighborhoods across the city were not too excited about a metro stop coming into their neighborhood, but it wasn’t out of racism or xenophobia. It was out of a fear of the disruption to business that construction would bring. Indeed many stores in areas like U St. and Clarendonwere knocked out of business due to Metro construction. The suggested 22-mile leg, which is being called the new Blue Line, could include room for 11 new stations. 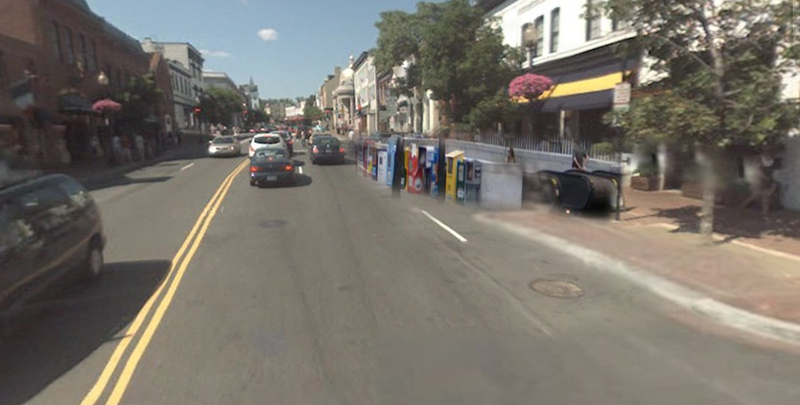 Among them would be a stop in Georgetown — at M Street NW and Wisconsin Avenue — where the idea of a Metro station was shunned a generation ago but is now welcomed as a tonic for parking and traffic problems. [It doesn’t help in stopping the urban legend when even the Washington Post keeps repeating it]. What happened to those plans you ask? Money. The new line would cost $6.3 billion to build and WMATA was already running a $5.2 billion shortfall. So the plans simply faded away. That is until last year. Last August WMATA staff gave a proposal to the WMATA Board of Directors addressing the long term structural needs of the system. In those plans was a revived proposal of a split Blue line, including a Georgetown stop. 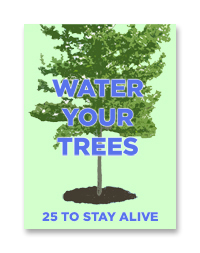 David Alpert at GGW has written extensively about this. Right now this is parking lot. There seems like there would be adequate room to build an escalator exit here. While no location around here would be without serious complications, this one seems the least complicated. The modern canopy is unlikely under any situation, by GM threw it in here just for consideration. As for the space itself, there seems to be a decent amount of room for an escalator here, but there may be a lot of complications trying to build so close to the canal. This plan would take out some of the parking spots and perhaps a lane on Wisconsin just south of M. in GM’s opinion, this would probably be a decent trade-off. There is never a ton of traffic coming up Wisconsin from K, and it is hoped that with a Metro there’d be a significant drop in driving anyway. These are just brainstorms. But it does seem that nobody has thought too hard about the location question more specifically than just “M and Wisconsin”. What do you think? Where would you put the entrances? Anywhere else you’d put the station? Maybe down closer to Key Bridge? How about the other direction towards downtown? While it was slow, it had an incredibly short headway of only 3-6 minutes (meaning there is only 3-6 minutes between buses). From a Georgetown perspective, the 30 Series offered a very frequently non-transfer ride straight through downtown or up to Cathedral Heights, Tenleytown or Friendship Heights…After the changes only three lines go through Georgetown: the 31, 32, and 36. Moreover, the 31 bus only goes to Foggy Bottom. The crosstown route now only comes every five minutes during peak and only every fifteen minutes during off-peak. That’s a significant cut in service, particularly for the off-peak hours which is when a lot of Georgetown’s senior citizens use the 30 Series to get around. To WMATA’s credit, they are taking the chance to re-evaluate the changes and see whether they’ve worked out as planned. Are you unhappy with the changes? Come to Tenleytown tonight and let your voice be heard. Georgetown’s Sweet Green lost to Dupont’s Tangy Sweet in an NBC poll. Unlike the “people watching” poll (also against Dupont), Georgetown at least made this one close. WMATA is taking another look at the changes to the 30s series it made last year. You have a chance to chime in during two meetings. 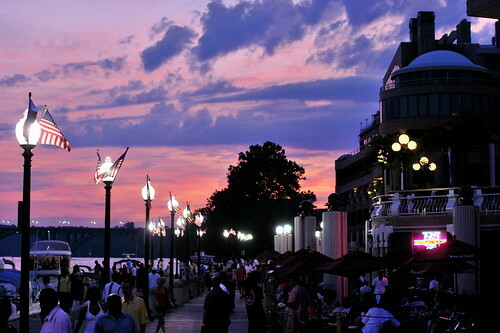 Photo of the Georgetown waterfront by Flickr user M.V. Jantzen used under Creative Commons. If you used Nextbus’ website, you need to select a destination. Select “Show predictions for all vehicles”. 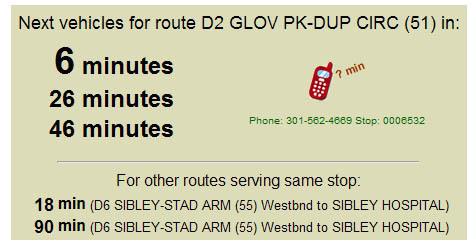 If you’re using the WMATA site, just skip the destination choice. Find out what your wait is. You should bookmark this page in order to skip ahead next time you need it, particularly if you have smartphone (GM has his most frequent bus stops bookmarked in his blackberry).